I remember exactly the day I bought Crème de la mer SPF 50 fluid. It was last summer on a sunny Sunday. As a sun protection I aready had on my face the Clinique even better SPf 50 (read more HERE). I spent many hours outside so after a while I decided to reapply it while I was walking. Soon after that a guy looked at my face in a strange way so I checked my face in a mirror and my skin was looking very ashy kind of a mix of bue/grey/purple ! I was so upset that all I wanted was to remove it from my face. I was walking by a mall so I stopped there to find micellar water and remove that horrible cream and came across the crème de la mer counter. The representative pitied me I think so she advised me on their SPF50 lotion. I was able to on my skin prior purchase first. It seemed good so I decided to get it. The packaging is simple easy to use and to carry around. The texture of the product is similar to a fluid hence the name. It gives my combination/dehydrated skin a perfect level of moisture and it does not give my skin an ashy look. If I apply a foundation on top it does not look oiler than normal. It does have a slight smell of sunscreen and it may sting your eyes if you apply it too close to this area. Also I have noticed a few weeks after use that there are tiny blue particles on that lotion. I don’t really know what it is there for, but once it is on my face I don’t see them anymore. To sum up I love this product but althought it lasts a long time what I love the least is the price £65/$90/€80 for 1.7fl.oz or 50ml !!!!!!!!!!!!! Who wins the battle ? Crème de le mer fluid does almost all I need: moisture and high protect. Also I wore this product when I was in India and then on vacation in Congo where I spent a lot of time outside under the sun so I can confirm that it protects the skin and my face never taned. My main issues with the Benefit dream screen is that I need another product to moisturize plus when I recently wore this product on vacation my nose peeled and my face taned on a very hot sunny day so I don’t really know what to think... Despite the price I choose the Crème de la mer fluid SPF50 over the Benefit dream screen SPF45. Have you tried those products? What do you think of them ? 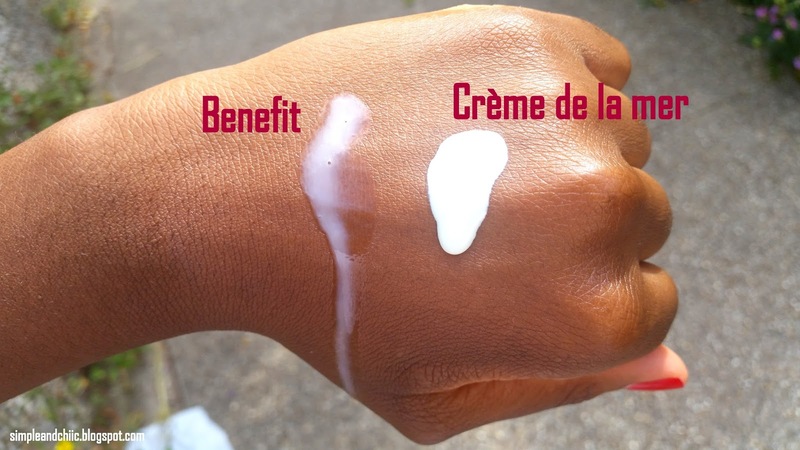 I will try to find creme de la mer here in Canada great review! Thank you and I hope you will like it as much as I do !